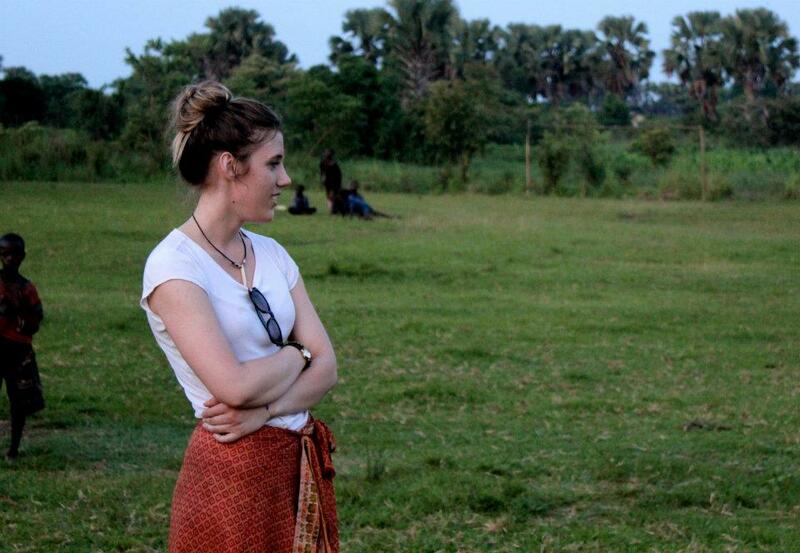 As a Political Science major at Creighton, 22-year-old Alison Prater came into her trip to Uganda with general knowledge of the basic political and social structures of the country. Prior to her departure, Alison also began to read books describing the sociological and political structures in Uganda as well as personal accounts of living among the people. Her knowledge deepened and her perspective changed as she met the people and experienced the culture. The two-week program in Backpack Journalism, immersed the students within the Ugandan culture while simultaneously creating a short documentary film about the role of music within the culture. Alison had never been to the developing world nor was she familiar with camera equipment, but she welcomed a new challenge and approached the trip with an eagerness to learn. “The amount of sincerity from the people was overwhelming.” Most places give you some sort of greeting when you arrive, but she said she had never received this kind of welcome. Even thousands of miles away from her home, she felt at ease. During her two weeks, she learned how to separate what truly matters in her life which she believes comes with any kind of travelling. It was not easy to balance making sense out of the injustices around her while also keeping up with her personal thoughts. She did not let this affect her ability to actively participate in her role as an interviewer for the film project. She said she struggled to remain focused sometimes, but she remained patient and asked for help when she needed it. Her greatest challenge during the trip was dealing with emotions in a foreign place. “Every single coping mechanism you usually have is ripped out from under you.” She struggled to process the immense desperation and suffering around her. She realized there were times when she could pretend that whatever was happening around her was not real. However, she was quickly reminded of the reality of the situation when she saw children wearing Green Bay Packers or Jonas Brother shirts. In addition to being exposed to new and often heart breaking sights, Alison faced the challenge of sharing it all through the class blogs. “For the first time in my life, I was speechless.” Her journal became more of a list of events than a descriptive narrative. She said it was hard to find the words when her mind was still trying to make sense out of everything that had happened. 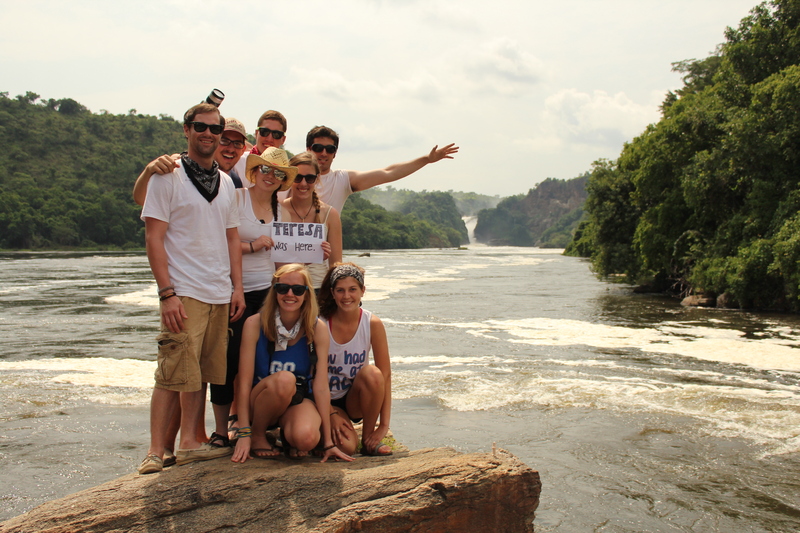 Her time spent at the top of Murchison Falls inspired what she called “pure happiness.” As she and her fellow classmates ran around the slippery rocks with their expensive cameras, warm light spread across the sky and it began to rain. She suppressed her urge to jump in the water, but the impact of the power of her surroundings remained. She said her time in Uganda is something to keep learning from and working from.. 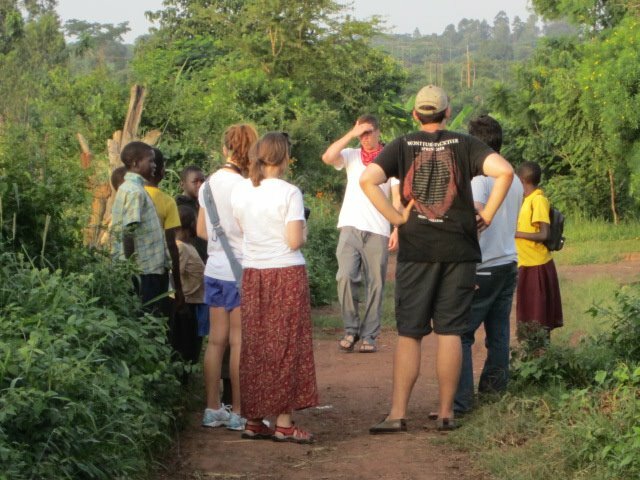 Sitting down for an interview in Abia, one of the more impoverished visits during the 2012 Faculty-Led Program Abroad to Uganda, one could always count on Jason Goins to ask the most important and most interesting questions. A man of height, military build, and reddish-brown hair, Jason evokes an image of a true Colorado native. He’s athletic, loves all things outdoors, is incredibly well-spoken, and has a proprietary strand of humbled intelligence that in this day and age is something one can only see in one who has a strong set of values. A Chemistry major who finds meaning in helping others, Jason hopes to focus his career around others, as well as answering questions he has about the world. 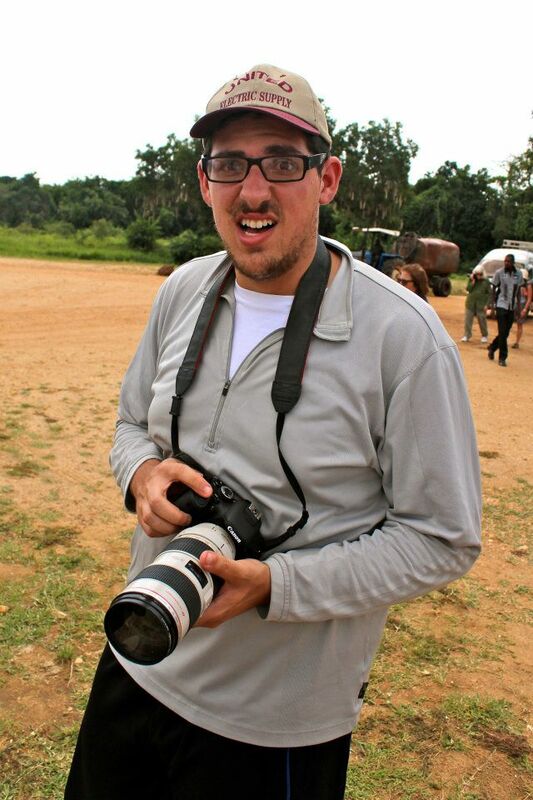 Through his time at Creighton, Jason has learned the value of making a difference, challenging oneself intellectually, and seeing the struggles of people in other parts of the world. 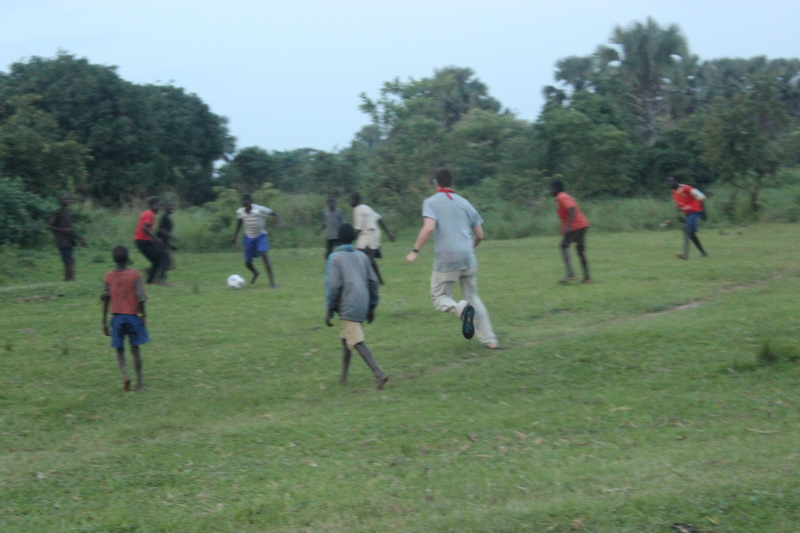 Jason playing soccer with local kids. A man of many goals, which include teaching Math abroad, Jason describes his overall goal (after fulfilling his commitment to the Air Force) as involving a research and development company that “focuses on the 90%.” According to Jason, the majority of the money in the world goes to only 10% of the people. He describes this goal as coming about as the result of, in his words, “beeps” he noticed throughout the latter part of high school and early college. He also said that studying Theology made him question the beliefs he had grown up believing, and that his Jesuit education made a difference to the focus he wanted his life to take. Jason, the tallest member of the group, with other members of the group. That led him to the backpack journalism trip because he said he wanted a different study abroad experience than normal. Jason said he was also focusing his experience on whether or not the group did anything to help the people they met along the way. Jason said he also was able to see people in a very different situation from his own, and learned a lot about what life is like for said people. Jason is currently getting ready for his senior year of College, fulfilling a commitment to the Air Force Academy once he graduates. After his commitments are up, Jason hopes to devote his time to doing what he can to fill the needs of others, something he feels is more important than anything else. The things I learned are too numerous to offer a complete list. My teachers in middle and high school always discouraged using the word “things,” it shows a lack of creativity and specificity. But I cannot anchor down what I learned with one description. Below is a highlight of those “things” in no particular order. – The world is a small place and getting smaller. Distance is becoming a harder excuse to use for ignorance and indifference. – Journalism should tell the stories that need to be told with an aim at the truth. – The people who went on the trip are amazing individuals. – Theology should be more evident in every day discussion. It also should be more apparent in worship. – Answers are not always the most important part of the question. – It was reinforced in my mind that the world, both nature and mankind, are worth fighting for and loving. – Real truth comes in helping others. – Communication is not just verbal language. – You do not need to speak the same language to make friendships. 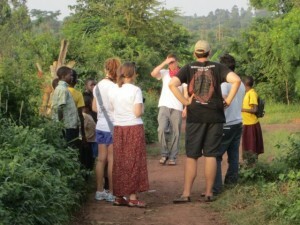 Local Lira children and Creighton students spending time together. Picture taken by Alison Prater. – Journalism serves the world. The world does not serve journalism. – Theology is not just and ideology for the spirit. It is an ideology that can manifest itself in all parts of life. – You are never too old to be a child. You are never too young or wise to listen to someone older than you. – Truth and reality come from experience. – Journalism is not just for those who write the newspaper. – The rich want to be more like the poor and the poor want to be more like the rich. Those who are busy with work want more time for themselves while those who have the time for themselves and no work want to be busy with a job. – I learned again that we are never done learning. The day I stop learning is the day I stop living. Thank you to the people of Uganda and my classmates who taught me so much. Upon returning from Uganda we have discussed the difficulty in deciding how to best react to the poverty we witnessed in such places as Ave Maria and Abia. Also, reading some of the personal stories of those who are sacrificing a life of comfort for a life serving the poor can reveal inadequacy in my own efforts to fight injustice (see the efforts of Paride Taban for example). On this note, Dr. O’Keefe pointed out that to be discouraged by this inadequacy to the point of stagnancy in one’s own efforts to serve others is the wrong response. It is like the person who does not vote because he/she believe that their vote won’t matter in the grand scheme of an election. While I may not have the money to support one candidate and noticeably sway the outcome of an election, if I do not vote I support and perpetuate an unhealthy ideology. This ideology says one person cannot make a difference in a world of 7 billion humans. This thought has crept into my mind several times since I have been back in the United States. Seeing the poverty in Abia desensitizes the problems I have witnessed in America. But to think that because something is worse makes lesser problems not as real is once again the wrong response. It is a fatal path that can lead to inaction. 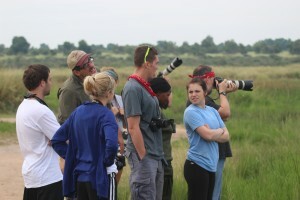 Just because I am not in Uganda does not mean I cannot make a better world at Creighton. Bigger problems should make smaller problems more real; they should awaken us to all injustices. I speak to myself when I advocate for both small and large changes, to not be tempted by the whisperings of inadequacy. To say that the poverty in Uganda marginalizes the problems here is wrong. Both should be given attention and deserve action fighting the problem. At Ave Maria, a young child no more than a year and a half old is carried by his older 7 year old sister. 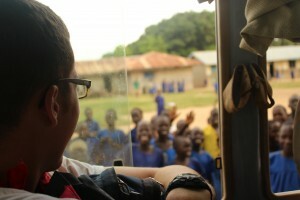 1 in 3 of the children at Ave Maria are HIV positive, while many are orphans. As I look through the pictures from my trip, I am reminded of the smoke that permeated the air from all the burning waste. 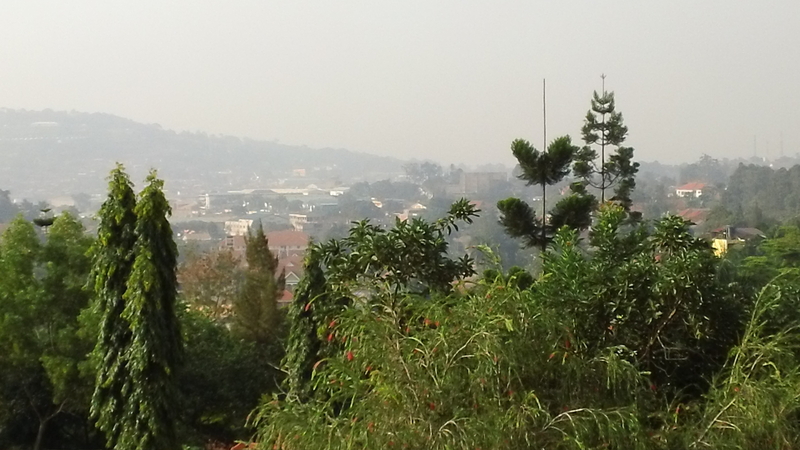 This sight was especially noticeable in Kampala, where from afar the city seemed as if it was smoldering. 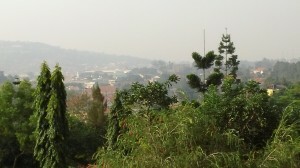 Smog above the city of Kampala. 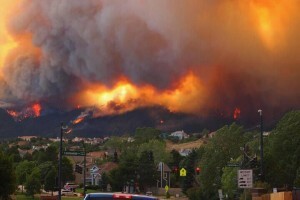 Now these pictures of a city up in smoke are not just of Kampala, but also of my neighborhood in Colorado Springs. From what it seems like, the entire state of Colorado appears to have caught aflame. When high winds and atmospheric pressure combined to spread the fire outside of Waldo Canyon and towards the outskirts of the part of the city in which I live, I received a barrage of pictures documenting the flames coming over the foothills. Fires burning on the front range of Colorado Springs. Picture provided by Adam Pink. Unfortunately, some neighborhoods were destroyed. An elderly couple was burned inside their house. I personally know some families who lost their home. On another occasion I know a family whose home is the only one left standing on their block. In no way to I intend to trivialize the situation in Colorado Springs by quoting the Joker in the Dark Night when he says, “Everything burns.” Science would say everything does burn, one just needs to find the right temperature. However, no matter how bad the conditions became (the fire was so hot it melted glass, lower grade glass melts at 900 degrees F, other grades melt around 3000 degrees) the fire could not incinerate the efforts of all the responders who fought to extinguish the fire. 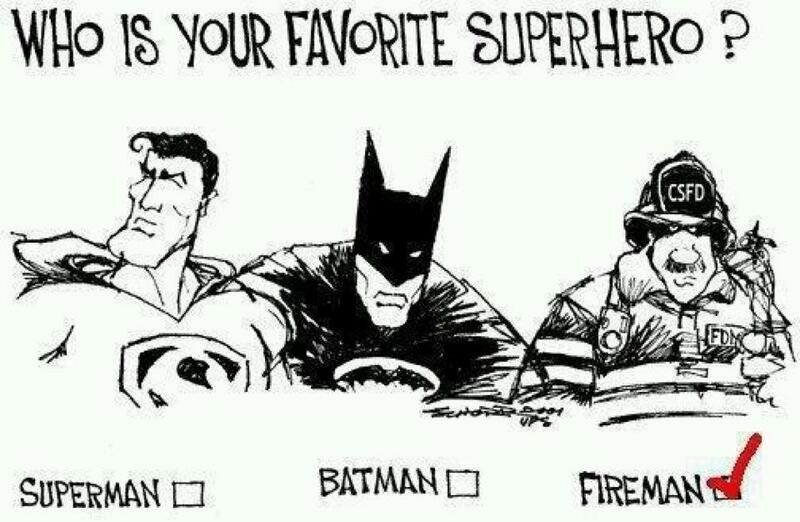 I saw a comic in which Batman, Superman, and a firefighter were all standing side by side and the caption read something along the lines of ‘who is your favorite superhero?’ There was a checkmark under the firefighter. As I watched a fire in a barrel shrivel the paper waste from my Grandpa’s farm outside of Yankton, South Dakota, I am reminded of those whose efforts are directed at putting out the fire around my home. I want to thank all those who fought and continue to fight the fires that have burned areas of the Midwest and all across America. 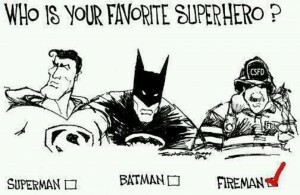 Your dedication, determination, and courage are examples of who real heroes are and what the entire human race can be. Though it is not even close to enough, I offer my appreciation and prayers for all that you have done and continue to do. Thank you. To kill it is to face imprisonment. Its name is written on the back of the national team football jerseys and its silhouette stands in the middle of the national flag. 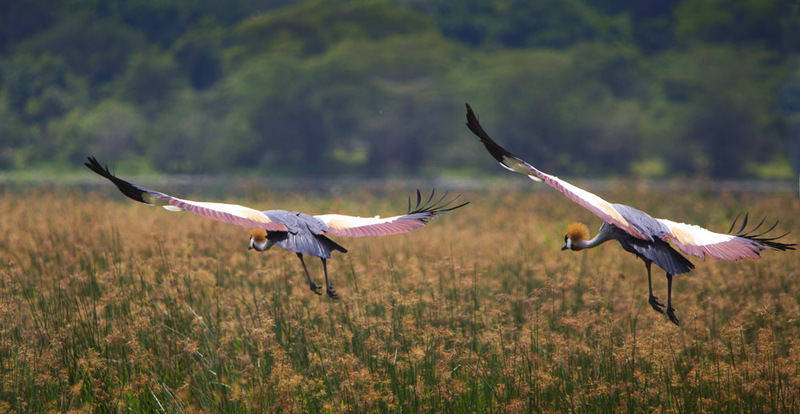 But the Crested Crane, the national bird of Uganda, has no idea of this celebrity. It modestly nests on the ground in tall grass located near water according to the International Union for Conservation of Nature and Natural Resources. 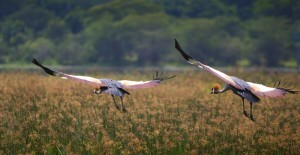 While the picture above is taken over the Nile, the Crested Crane’s habitat extends from Zimbabwe to South Africa. Being near the equator, it does not migrate like the birds I am used to in North America. If it moves, it is usually in search of food or safety from human encroachment. Our tour guide traveling up the Nile River said that the cranes pick a partner and mate for life. He also highlighted that like the native Ugandans, they are communal. They roost in large groups, sometimes up to 200 birds. 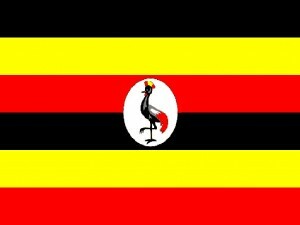 Possibly this is one of the reasons that the bird is displayed prominently on the Ugandan flag. A certain reason is that its plumage conveniently contains all the colors of the flag. Our guide for the trip, Herbert, also stated that the crane is depicted on the flag with one leg up to represent that Uganda is always moving forward. Jokingly he added that he sometimes is not sure what this “forward” leads to. 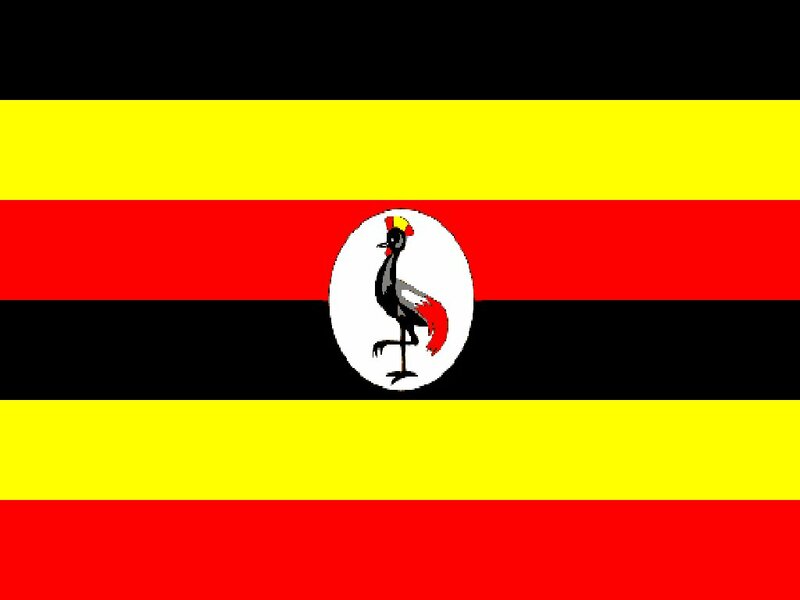 The national flag of Uganda. Picture taken from Wikipedia. The Farm View Country Resort was the place we stayed throughout the duration of our trip in Uganda. Nicknamed the “Haven Away From Home,” it was located in the outskirts of Lira, one of the most populous cities in Northern Uganda. To get to the resort, however, was more like an adventure than heavenly. 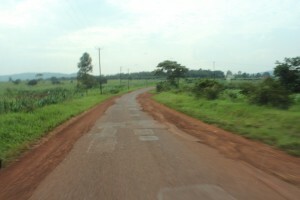 Located about 2 kilometers away from the street, we had to take a winding dirt road all the way to the hotel. On the way, traditional viliages could be seen, as well as all the children waving and chasing the bus to the beginning of the hotel’s drive way. Compared to many of the other hotels in Uganda, Farm View really stood up to its reputation. The hotel had great water pressure for showers, spacious rooms with cable television hooked up, and a beautiful acre of grounds to which the building resides on. Personally, one problem I had was with the beds. I found myself waking up in the morning with such a stiff back that I couldn’t walk upright in the morning, But, considering that bed in Uganda are thin compared to that in the States, it was not that big of a concern. One thing that Farm View is excellent at is customer service. The owners, Florence and John, have a full staff of employees to take care of their guests concerns. Whether that be personally doing laundry, ordering food and beverages, or asking for extra pillows, they are happy to oblige. Besides this, some of the best food in all of Lira is at the Resort. Whether it be spiced chicken and rice, curried beef with noodles, or fried fish with African Cole slaw and mangos, all of the meals are excellently prepared by Farm Views very own chefs. Overall, this resort was truly a “Haven Away From Home” to a bunch of Americans trying to shoot a documentary. This blog starts a series of several blogs that have been in the making since my last days at Uganda. For some time, I was unsure how to finish each of them. This lack of finality was coincident with my inability to find answers to some of the questions that were raised during the transition from Uganda back to Omaha. While I personally believe I have not found the right answers to these questions, I think I am ok with the uncertainty. While I will not chronicle each one of these issues, nor offer any conclusions of lasting permanence, I hope to illuminate some of the issues in the next couple of blogs. I can add though with conviction that unlike the page in which I type up this post now, life is never just black and white. Going to Uganda may have started as a search for these black and white answers, but it ended as a search for the right questions. Limiting myself to black and white answers is like seeing a person for the color of their skin. It is a view that lacks truth and substance. And so while I finally add the endings that these next several blogs have patiently waited for, I pray that I never find an ending for the search that Uganda helped reinforce. May this search for truth not seek closure but rather opportunities and more openings. What is that contraption with two wheels? Oh, yeah, a bicycle. Before this trip, I never knew how to ride a bike. Embarassing, yes, but since my uncle got hit by a car when he was learning as a child, my mom never bothered to teach me. Yet, riding bicycles is a way of life in Uganda. Because transportation is so expensive for Ugandans because of fuel prices, people usually always walk or ride their bicycle to wherever they need to go. It was a completely different change stepping into a culture that relies on walking and bicycles rather than using cars. Back home, if someone were to ride their bike along West Dodge Road they would be considered a crazy person. But not in Uganda. Besides walking, people bike miles to get to the place they need to. Also, bicycles can be used as a great way to transport many things that would be rather difficult transporting by walking. Ugandans find ways that seem impossible to stack items on their bicycles that in the end are taller than the person riding the bike! Many of those popular items mentioned above include bananas, wood, furniture, and clothing, and chickens. .For example , as we were driving along side of the road, there was a man that had strapped to his bike 8 chicken cages stuffed with the birds. Unfortunately, I was not able to grab a photo of it, but sights like that are truly a common way of the streets. Coming from a person that just learned how to ride a bike, these people are pros, and there’s not a doubt in my mind that this is just one thing that Americans cannot execute as gracefully nor as efficiently as Ugandans. To be completely honest, I really wasn’t that religious before I went on this trip. I don’t go to mass, don’t read scripture, and lost track of the daily habits of the religion I am supposed to belong to. I guess after going to a Catholic grade school, Jesuit high school, and now Jesuit university, the whole religion thing kind of lacks interest to me now. Something that I am incredibly appreciative of since returning from Africa is the definition of community. In a theological sense, a community is a church, seeing that they celebrate the mass together, mourn the loss of someone together, and celebrate the birth of something new. I didn’t expect the communities in Africa to be so sincere. Everyone is constantly depending on everyone else just to get by, and it made me really appreciate everyone that is in my community back home. I’m glad I sticked it out, because in the end, this trip made me a better person. I learned never to take anything for granted and to always count your blessing. More importantly, I learned that giving back is one of the best things you can ever do in life. For now, that’s how I feel when working on this film, giving back. Myself and everyone else that has spent the weeks and months working on this get to show a message of what is going on in a completely different part of the world currently. We are getting people to give a damn about someone rather than themselves, and in the end, I’m happy. I knew going into this trip the journalism part of this trip would be a learning experience. Before this, I didn’t know how to work a camera to same my life. But now, I come back with a better understanding and appreciation for workers and students in communication arts. Shooting film, uploading it, and editing it sounds easy, but its tedious and time consuming. I love learning how to do something completely new and learning it cold turkey like we did before going on this class. It’s ultimately how you learn. Or at least how I do. There are so many moments that happened in Uganda that I will cherish for the rest of my life. There are so many things that I will miss about Uganda. Honestly, I’m grateful. I’m grateful for this trip because I found out so many things about myself that I didn’t even knew. I owe the people of Uganda everything. I will be back. I don’t know when, but I will be back. I want to see Africa grow as much as I did for when I return. But until then, stay beautiful, Uganda.